April, the TMNT and Jagwar have spent several weeks rafting down the Pursus and Amazon rivers, living off the land and experiencing an all new and invigorating lifestyle. Jagwar teaches our heroes how to thrive in the jungle and they tell him tales of their adventures, much to the delight of everyone involved. Eventually the group meets a local tribe known as the Coipacu. They are lead by an elderly woman who holds the title of Paleocha. The woman speaks the “forest language” (something Jagwar is well versed in) and invites our heroes to supper. Jagwar explains that it’s fortunate that the Turtles are turtles, as the Coipacu believe that the world is an island borne on the back of the Great Turtle. The locals bring the protagonists to a majestic tepui, and lead them through a a cave that reveals an unbelievable world within… populated by not only the Coipacu, but dinosaurs as well! Later that evening, Jagwar translates the Paleocha’s story about a new creature that has appeared in the tepui – a half man half wolf! Since discovering the wolfman, the tribe has set out a nightly offering of food forhim. Jagwar also relates that pirate-miners have discovered this paraidse and have begun to kidnap their young men and make them into slaves. The Paleocha seeks the help of the TMNT to stop the pirates and save her people. Suddenly a howl erupts out of the jungle and everyone spots the wolfman, who has arrived to take his nightly offering. The beast quickly takes his food, noting in English, “That be good stuff, mon” before he zooms back into the jungle. 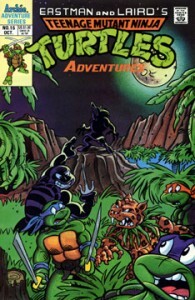 Later, the TMNT, Jagwar and April head out to investigate the pirate-miners camp at a nearby tepui. The spot hundreds of slaves being forced to dig, and are quickly discovered by an armed guard. Mikey dispatches the man and the heroes attack the pirates. The battle goes well, but Jagwar is surprised by a pirate and held at gunpoint. Before the man can force the Turtles to drop their weapons, something comes screaming out of the jungle at incredible speed and knocks out the villain. The rescuer is the speedy wolfman, who tells Jagwar, “You owe me, mon.” Jagwar cheerfully agrees and the anthropomorphs work together to free the Coipachu slaves. From a distance, we see a cowboy who calls himself The Kid watching our heroes through binoculars. He notes that the Turtles have been joined by a wolfman and that they’ve wrecked this operation. He also states that Mr. Null is going to be very unhappy with this news. The Kid calls Null and briefs him on what’s happened – Null is upset and tells his henchmen to keep tracking the TMNT to see what motivates them. The Turtles are welcomed back by the Paleocha and she gives Donatello a gift to thank the Turtles for saving her people. Don is honored to receive the present, which is the leader’s ancient staff. The Paleocha than asks to know more of the wolfman, and he explains that his name is Dreadmon – but at this moment, he’d rather be eating than talking. Mikey backs up Dreadmon on this plan of action. Later, Don practices with his new staff while the others bask in the beauty of the tepui.